Not to be confused with Track class. In the United States, railroads are designated as Class I, II, or III, according to size criteria first established by the Interstate Commerce Commission (ICC) in 1911, and now governed by the Surface Transportation Board. There are six US Class I freight railroad companies. 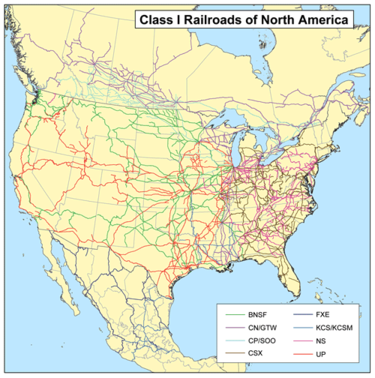 Canada has two Class I freight railroads, both of which have trackage in the US. Mexico has two Class I freight railroads, one with trackage in the US. In addition, the national passenger railroads in the US and Canada, Amtrak and Via Rail, are both Class I. Initially, the ICC classed railroads by their annual gross revenue. Class I railroads had an annual operating revenue of at least $1 million, while Class III railroad incomes were under $100,000 per annum. All such corporations were subject to reporting requirements on a quarterly or annual schedule. If a railroad slipped below its class qualification threshold for a period, it was not necessarily demoted immediately. For instance, in 1925, the ICC reported 174 Class I railroads, 282 Class II railroads, and 348 Class III railroads. Since dissolution of the ICC in 1996, the Surface Transportation Board (STB) has become responsible for defining criteria for each railroad class. The bounds are typically redefined every several years to adjust for inflation and other factors. The initial $1 million criterion established in 1911 for a Class I railroad was used until January 1, 1956, when the figure was increased to $3 million (equal to $27,646,267 in 2018). In 1956, the ICC counted 113 Class I line-haul operating railroads (excluding "3 class I companies in systems") and 309 Class II railroads (excluding "3 class II companies in systems"). The Class III category was dropped in 1956 but reinstated in 1978. By 1963, the number of Class I railroads had dropped to 102; cutoffs were increased to $5 million by 1965 (equal to $39,751,848 in 2018), to $10 million in 1976 (equal to $44,029,240 in 2018), and to $50 million in 1978 (equal to $192,066,327 in 2018), at which point only 41 railroads qualified as Class I. In a special move in 1979, all switching and terminal railroads were re-designated Class III, including those with Class I or Class II revenues. Regional railroads: operate at least 350 miles (560 km) or make at least $40 million per year. Local railroads: non-regional but engage in line-haul service. Switching and terminal railroads: mainly switch cars between other railroads or provide service from other lines to a common terminal. In the United States, the Surface Transportation Board defines a Class I railroad as "having annual carrier operating revenues of $250 million or more in 1991 dollars", which adjusted for inflation was $452,653,248 in 2012. According to the Association of American Railroads, Class I railroads had a minimum carrier operating revenue of $346.8 million (USD) in 2006, $359 million in 2007, $401.4 million in 2008, $378.8 million in 2009, $398.7 million in 2010(p1) and $433.2 million in 2011. In early 1991, two Class II railroads, Montana Rail Link and Wisconsin Central, asked the Interstate Commerce Commission (ICC) to increase the minimum annual operating revenue criteria (then established at US$93.5 million) to avoid being redesignated as Class I, which would have resulted in increased administrative and legal costs. The Class II maximum criterion was increased in 1992 to $250 million annually, which resulted in the Florida East Coast Railway having its status changed to Class II. Rail carriers with less than $20 million in revenue are designated as Class III. In Canada, a Class I rail carrier is defined (as of 2004[update]) as a company that has earned gross revenues exceeding $250 million (CAD) for each of the previous two years. Class I railroads are some of the most efficient forms of transportation, moving a ton of freight almost 500 miles with each gallon of diesel fuel (0.47 l/100 km to move 0.91 metric tons). ^ Operated by Grand Trunk Corporation, a wholly owned subsidiary of Canadian National Railway. ^ Operated by Soo Line Corporation, a wholly owned subsidiary of Canadian Pacific Railway. ^ Operated by Kansas City Southern de México, a wholly owned subsidiary of Kansas City Southern. A Class II railroad in the United States hauls freight and is mid-sized in terms of operating revenue. As of 2011[update], a railroad with revenues greater than $37.4 million but less than $433.2 million for at least three consecutive years is considered Class II. Switching and terminal railroads are excluded from Class II status. Railroads considered by the Association of American Railroads as "Regional Railroads" are typically Class II. An example of a Class II would be the Florida East Coast Railway. The last major change of the upper bound for a Class II railroad was in 1992, when the Florida East Coast Railway was changed from a Class I railroad to Class II. A previous change in 1991, which prevented two railroads—Montana Rail Link and Wisconsin Central—from becoming Class I, was made at the request of the two railroads, as they did not wish to take on the extra cost and paperwork associated with Class I status. [full citation needed] Changes since then have been adjustments for inflation. A Class III railroad has an annual operating revenue of less than $20 million (1991 dollars). Class III railroads are typically local short-line railroads serving a small number of towns and industries or hauling cars for one or more railroads; many Class III railroads were once branch lines of larger railroads or abandoned portions of main lines. Many Class III railroads are owned by railroad holding companies such as Genesee & Wyoming, Watco Companies and Iowa Pacific Holdings. In the United States, the Surface Transportation Board continues to use designations of Class II and Class III since there are different labor regulations for the two classes. ^ Association of American Railroads|AAR "Class I Railroad Statistics", November 18, 2008. ^ Association of American Railroads|AAR "Class I Railroad Statistics", May 24, 2010. ^ Association of American Railroads|AAR "Class I Railroad Statistics", October 29, 2010. ^ "Class I Railroad Statistics" (PDF). Association of American Railroads. February 7, 2012. Retrieved October 31, 2013. ^ a b "Class I Railroad Statistics" (PDF). Association of American Railroads. April 17, 2013. Retrieved October 31, 2013. ^ Branch, Legislative Services. "Consolidated federal laws of canada, Transportation Information Regulations". ^ Warren Buffett (2016). "Berkshire Hathaway 2016 letter to shareholders" (PDF). p. 11. Retrieved March 6, 2017. ^ "ASLRRA FAQ". Archived from the original on May 6, 2014. ^ "Arrivals and Departures". Trains. November 1992. ^ "Arrivals and Departures". Trains (Free full text)|format= requires |url= (help). Stover, John F. (1999). The Routledge Historical Atlas of the American Railroads. New York, NY: Routledge. ISBN 0-415-92140-6. Uniform Classification of Accounts and Related Railway Records (UCA); retrieved April 24, 2005.